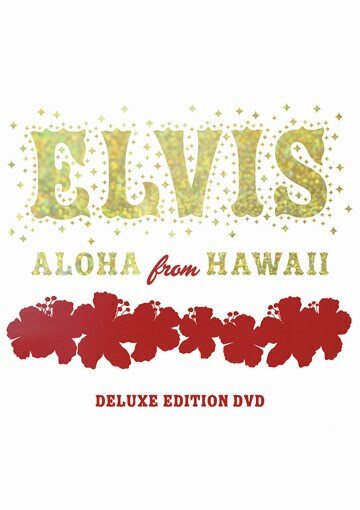 I'm a MASSIVE Elvis fan...and two DVD Box Sets I really wanted to have were the "68 Comeback Special Box Set" and the "Aloha From Hawaii" box set. I already shared the 68 Comeback Special with you in Episode 42 of The MJ Show (Click on the link if you've not seen it already) and exactly 42 episodes after that I have the joy of sharing the other incredible concert dvd with you! What I have for you tonight is something that shows you the power...the energy...the charisma...the charm...the magic that was Elvis Presley. I've always said this. When he was on stage...you could not get your eyes off him. Don't believe me...then watch this concert that I have for you. And for the love of God, music and all that is good...go out and buy yourself a copy of this box set. What I've given you here tonight is just a small portion of what's on the box set. 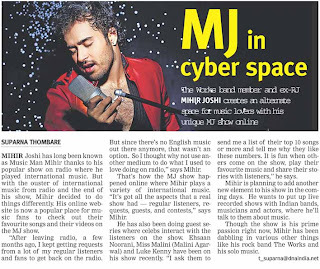 On a different note, The MJ Show was featured in DNA After Hours (27th April 2010). Also if you saw the header of the site I'm sure you would have noticed the incredibly cool "Musicman" Mihir logo on it. Have a look at how it looks in colour and black and white. The logo was designed by my friend Vishal Bharadwaj and I think he has done an absolutely brilliant job of capturing the two things I am extremely passionate about...the two things that kinda got together and helped me choose the name "Musicman" about 6 years ago when I began radio. Superman and Music. The logo is a beautiful tribute to both these elements. Do let Vishal and me know what you feel about the logo in the comments here! Now if you've heard me, back when I was on radio, or if you knew me in real life, you'd know that I'm not really a BIG hip hop fan. I mean...sure it's great music to dance to when you're at a party but it's not often that you'll see a lot of hiphop on my ipod...or me listening to it when I'm sitting at home. Recently I got an album from Universal music which almost compelled me to sit down and pay attention. I've always loved going to the roots of a music form...going back in history to see how things began and then tracing their way to the present. This album helped me do that. 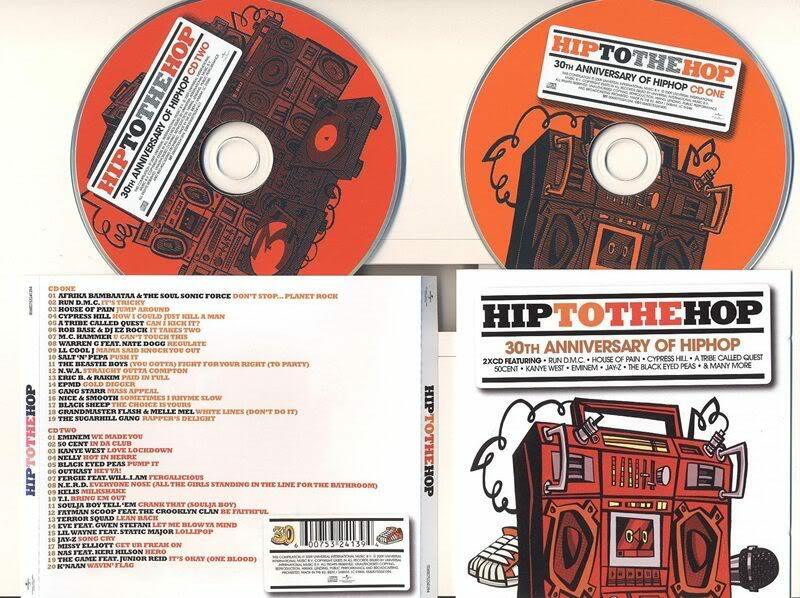 It's a fabulous compilation called "Hip To The Hop - 30th Anniversary Of Hip Hop" and it's got some of the best old school and modern rap and hiphop songs. However, the best thing it has is a small booklet that documents the history of hiphop. It's an absolutely fascinating read and I highly recommend it not only to hiphop fans but also to a lot of others who're not exactly in love with the genre. I've always said that don't be a metal or a rock or a jazz or a blues or a "genre" fan. Be a fan of good music and you'll find it in every genre. Have an open mind about music. You'll never know when you find something spectacular in each genre! The collection is a 2 cd set with 35 songs. What I'm going to do right now is pick my favourite songs from both cds and give them to you here. And then you can go pick up the album and check out all the songs. First up I'm going to give you some songs from CD Two because they're the old school songs. Great songs right? Let me know what you think on twitter (@MusicmanMihir) or here in the comments. Now let me admit this right off the bat, I'm not a massive fan or anything but someone was telling me about the fact that 27th of April was Feroz Khan's death anniversary and that it would be fitting if I paid a small tribute to the man on The MJ Show. So I thought to myself. Okay, maybe I'm not a huge fan but there are thousands out there who are. Who knows...maybe YOU are a fan...and he WAS a style icon in a way and a really influential film star so I thought why not? So here it is. The first tribute to a Bollywood star on The MJ Show. If you like it we'll keep having these every now and then. One of my FAVOURITE songs from the 80s. Whenever I did an occasional hindi songs show on FM Rainbow...this used to be one of the standards on the show. Had to give you one more song from this movie! A CLASSIC coming up! Full on HOT song of the day...and I think it still qualifies as such! Hell it's got Rekha in it. That's enough reason to consider it smokin hot! This one's got a bit more than :) Here you go! First up...the english song and then the hindi one! Man! I remember this song from my teenage years. What an awesome song this was and still is! :) And I remember that this movie had Madhuri Dixit and I had the biggest crush on her as a teen :) Awesome stuff! And here comes junior :) Fardeen Khan features in another movie produced by his dad. In fact if I remember right, this was Fardeen's debut film! Yep. Just confirmed that. It was his first. Have a look. How was that? Hope you enjoyed the songs. Good fun eh? :) heh :) Hope you enjoyed these. We'll have more soon! Comprising of lead vocalist and guitarist Jack Black and lead guitarist and vocalist Kyle Gass, the band has released two very awesome albums - Tenacious D (2001) and The Pick of Destiny (2006). In a way...THIS is also what rock n roll is all about isn't it? Having a whole lotta fun! This one's called "The Complete Master Works 2"
JACK BLACK AND KYLE GASS ROCK!! Twitter does give me some of the best ideas for shows here. Just a little while ago I was speaking with @OldmonkMGM about something. No wait, I think he tweeted something about Pat Boone covering a rock song and that reminded me of this BRILLIANT album I picked up at the last Universal Music sale that happened in Mumbai. It was an album called "Rock Swings" by Paul Anka and it was absolutely brilliant! So I thought that tonight, I'd share that album with you. I found almost all songs off it here. Just missed out a couple...but I know you'll hear them when you go out and buy this album! :) Please do buy it. I think it's completely worth it. This album is proof that EVERYONE can get into rock music. You can change it around...tweak it around...make it totally different...but the point is that there are some INCREDIBLE rock songs and absolutely everyone and I DO mean everyone can get into rock n roll music. Rattle And Hum was the name of an album as well as a video release done by U2 in 1988. The album, which was made following the band's 1987 Joshua Tree Tour, is a mix of live recordings, covers, and new songs. To a greater extent than their previous album, The Joshua Tree, the band explores roots rock, and incorporates elements of blues-rock, folk rock, and country. The accompanying documentary film documents the band's Joshua Tree Tour of the United States and the band's experiences with American music. This was in my opinion U2's best period. I do love a lot of their other songs as well but this entire album and The Joshua Tree before that...to me...that was U2 at it's best! Parag Kamani, my last "Guest" spoke about Jeff Wayne's "The War Of The Worlds" in his second song yesterday. Well, this is something I've been meaning to check out for a while...so today, I did! And I thought it'd be great to share it with you so here it is. Jeff Wayne's The War Of The Worlds in 2 forms. First up, I have the musical based on the album! And finally...the Audio Version. Here's what the LP sounded like! "The Red Weed (Part 1)" & "Parson Nathaniel"
"The Spirit of Man" & "The Red Weed (Part 2)"
"Brave New World" & "Dead London"
"Epilogue (Part 1)" & "Epilogue (Part 2) (NASA)"
How incredible was this! This show alone shows me how incredible this new medium is. Hope you all enjoyed this one.